How is your game developing? Fitness improving but in terms of technique you appear to have hit a wall? Friends or fellow club members may be willing to offer advice, but those who do are often brave souls, particularly if you are having a bad day on court when the last thing you need is someone explaining why you've put the last three backhands out of play. Even if your ego can stand being told where you're going wrong, it may well stubbornly refuse to absorb the advice because it represents an admission of failure. This is where the attentions of a good coach can make all the difference. Where you won't listen to fellow players, you certainly will to an authority figure with a list of coaching credentials and the licence to prove they know what they are talking about. Remember to check out these credentials before booking a lesson, by the way. Ideally, you want an individual who has followed the training scheme run by the sport's national association. 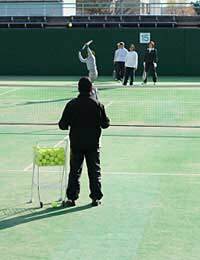 Rather than turning to a coach when your learning curve flattens out, it may be a good idea to book some lessons before you've even picked up the racket, so that you get off on the right foot from the very beginning. It may sound like a nightmare for a coach when the student can't even make the most basic of shots, but that is far less frustrating than having to take charge further down the line when the student has already settled in to some bad habits that need eradicating. Coaches may be resident at your local club or operate independently. Ask around among your fellow members or friends and see who they recommend. Once you've taken the decision to invest in some lessons, the next question is whether you want to learn as part of a group or receive coaching on an individual basis. The latter may sound like the best option, but it is likely to cost more and it can prove less rewarding for both of you if a good working relationship fails to click into place. At least if you are part of a group, you can listen to the coach's advice without having to spend too much time interacting with them should you find them not as patient as you would like. It should go without saying also that when joining a class, ensure that it is designed for and populated by players of similar ability to yourself - otherwise you won't feel the benefit and you will be wasting your money. How much are lessons likely to set you back? Between £10 and £20 for coaching on an individual basis, about half that for tuition as part of a group. Beginners' courses are likely to cost less than those for intermediates and advanced students, when lessons are likely to be focused on specific techniques or in-game situations. If you are having a problem in a specific area of the game, this may be the time to opt for individual lessons so that the coach can zero in on the problem and discuss possible solutions. Building up a good relationship with your coach will be a rewarding experience, providing someone to bounce ideas off. You will certainly notice the positive effect it is having on your game, and more than justify the extra pounds it is adding to the monthly bank statement.